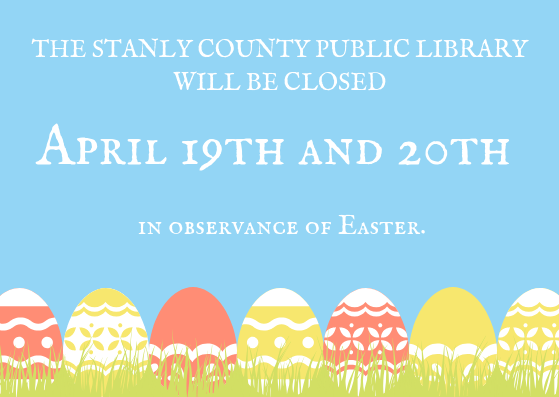 The Stanly County Museum is a department of the Stanly County Public Library and works closely with the Stanly County Historical Society, whose office is housed in the museum’s building. 1st Saturday of the month: 9 AM to 1 PM. 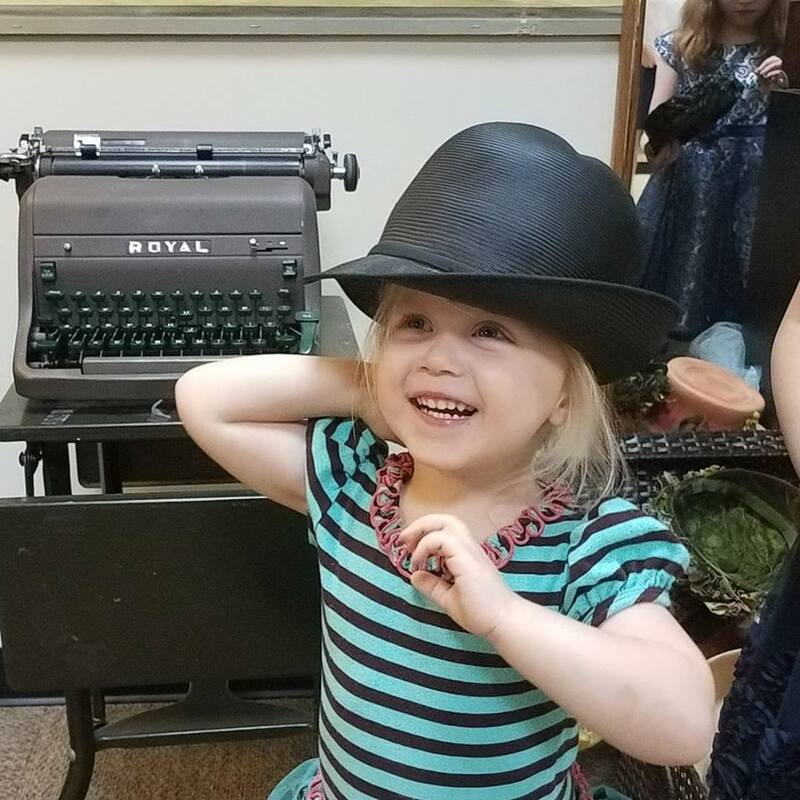 This exhibit begins with the first settlers of Stanly County, the Native Americans,and then examines Early Education and Home Life, Transportation, Industries, Military Battles, and the last 100 years. Visitors can listen to oral histories from Stanly County World War II veterans, card cotton, learn how to transfer calls on our interactive telephone switchboard and much more. The Stanly County History Center has a new exhibit on display. 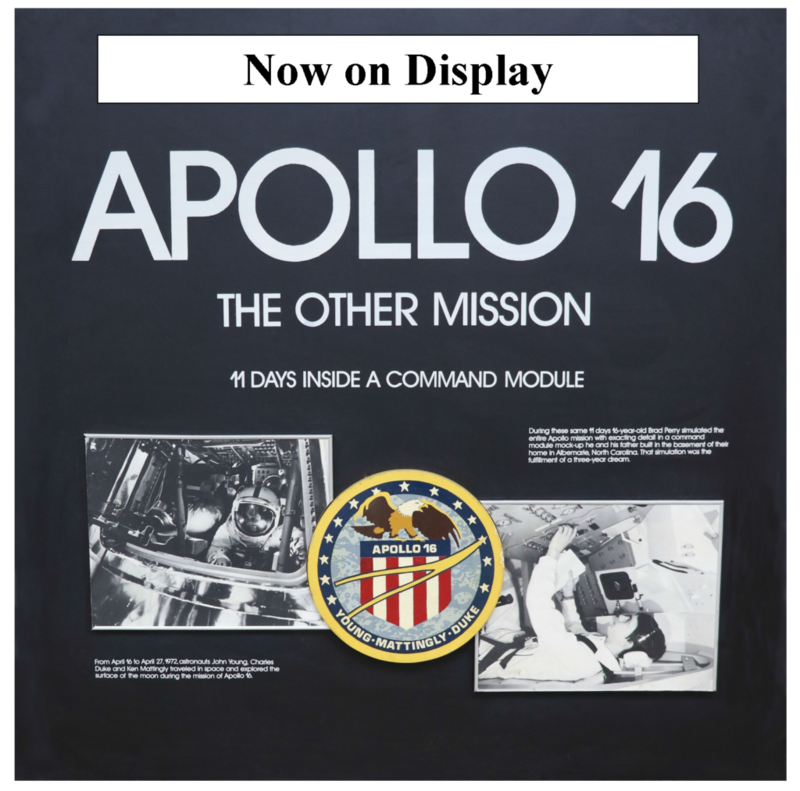 Brad Perry, who was a 16-year-old student at Albemarle High school in the 1970’s, gained national attention when he constructed a mockup of the Apollo Command Module in the basement of his home. 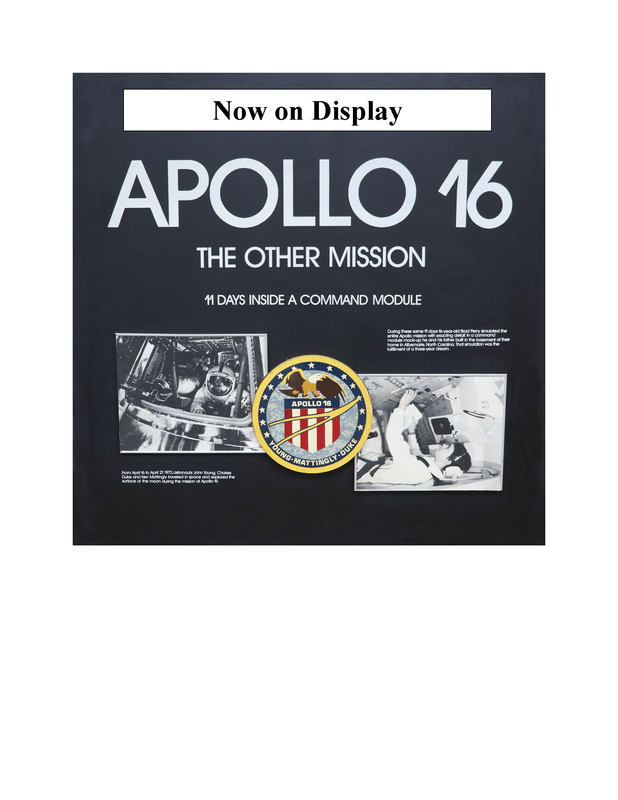 When you come to the Stanly County History Center you will be able to look inside Brad’s Command Module mockup where he spent 11 days, one hour and 51 minutes simulating the Apollo 16 lunar mission. Brad graduated from Georgia Tech, served 6 years flying as a U.S. Air Force pilot, and spent his career working for NASA. He holds an Airline Transport Pilot Certificate and has over 3,800 hours flying time. November 2018 marked the 100 year anniversary of the signing of the armistice that ended WWI. The Stanly County museum is honoring this event with WWI: Over There in our Changing Exhibit. The exhibit includes military gear and weapons, stories and photographs of Stanly County World War I Veterans, maps marking major battles and letters and photos from soldiers documenting their time “over there”. Over 60 letters are available to read that were written by Stanly County Native Harvey Underwood that detail life in Stanly County during the early 20th century as well as the horrors of War. of the area, Dr. Boone was granted exclusive interviews with Hitler’s sister, Hitler’s immediate superior on the French and Belgian front during WWI, and Hitler’s personal pilot. Dr. Boone compiled his research into his book Hitler at the Obersalzberg. This book, as well as other items from Nazi Germany, are currently on display at the museum. Admission is FREE. 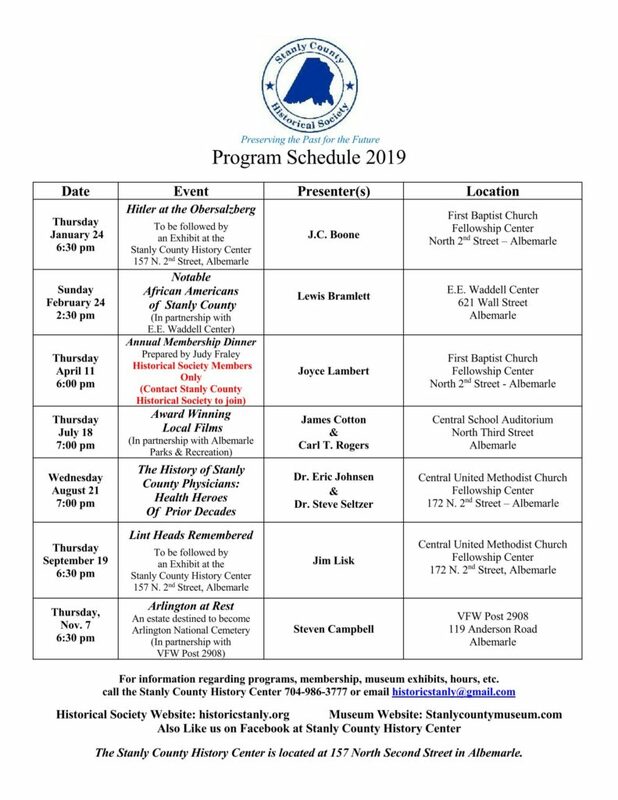 The Stanly County History Center is a public and educational service provided by Stanly County Government.